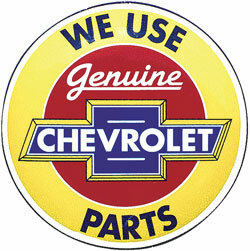 Classic Industries offers a wide selection of Home and Office Decor for your Chevrolet Chevy II Nova. Classic Industries offers Chevrolet Chevy II Nova Banners, Chevrolet Chevy II Nova Clocks, Chevrolet Chevy II Nova Lamps, Chevrolet Chevy II Nova Mugs & Cups, Chevrolet Chevy II Nova Office Chairs, Chevrolet Chevy II Nova Posters & Artwork, Chevrolet Chevy II Nova Signs, Chevrolet Chevy II Nova Stools, and Chevrolet Chevy II Nova Tables. This poster displays a mosaic history of Classic Industries® catalog covers dating back to the early years, showcasing the impact Classic Industries® has made on the restoration parts industry. As tough and authentic as real street signs with heavy embossed letters and bright, baked-on enamel colors. This street sign will give you the right direction every time! Perfect for decorating the workshop, den or rec room! Featuring the classic "Bel-Air" script and crest logo, this stool stands 30" high, topped with a rugged vinyl-covered seat that measures 14" in diameter. Complete with a swivel base and chrome-plated legs. Neon Clock - Nova Super Sport - 15"